The “Marmot” team is back at the University, it’s time for a summary of the two months of the 2013 field season! Hard start, the climate was harsh making the work of the team particularly difficult! Fortunately the Santel chalet, rebuilt last summer, was a salutary refuge! Marmots also suffered! 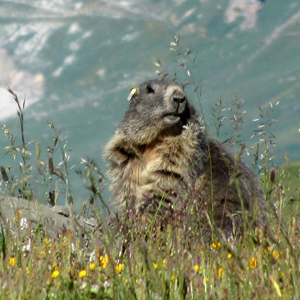 We observed that many marmots of 2012 had not survived the winter. Fortunately, the survivors were in good condition. With traps baited with dandelions, we were able to capture nearly 200 marmots of the Grande Sassière population: adults, young marmots are passed through our hands for the annual follow! Behavioral experiments to test the reaction of the dominant face marmot marmots dominant odor of other territories went well. We were able to film the anticipated face smells territorial behavior. However, there is not yet enough data, next year the adventure continue! The new study population, located on the Gulf of Tignes, allowed us to obtain DNA samples for 54 marmots and records whistling marmots face of danger (dogs were a great help to scare our marmots without eat them). After plowing particularly late this year, the flowers eventually wallpapering the entire prairie! In addition to observing marmots, we had the opportunity to observe ibex, chamois, foxes, golden eagles, vultures, snakes, frogs, etc! The collectedes Factbook has been possible thanks to the interns and volunteers this year, a big thank you to all! This entry was posted on September 7, 2013 by marmotmarmota in Uncategorized.